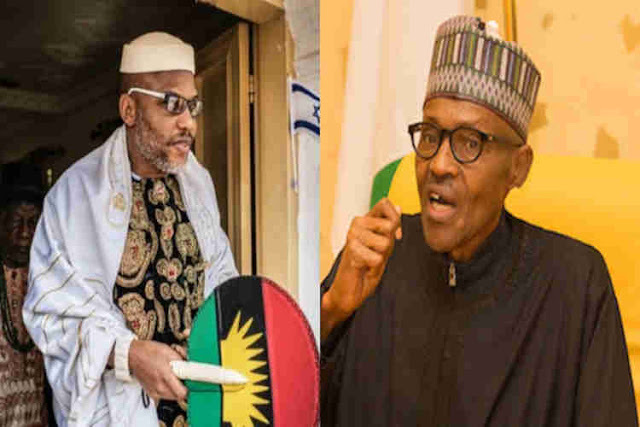 The self-acclaimed leader of the proscribed Indigenous People of Biafra (IPOB) Nnamdi Kanu, has replied President Muhammadu Buhari, saying he is not the one in Poland. Concise News reports that the President denied the rumour that he is a clone on Sunday in Krakow, Poland, during an interactive session with the Nigerian community in the country. But on Sunday, President Buhari while speaking in Poland where he is attending a climate change summit, told some Nigerians living in the European nation that he would soon celebrate his 76th birthday adding that “a lot of people hoped that I died during my ill health. Somebody just thought I am cloned, … it is real me I can assure you”. “I said Jubril is an impostor, not a clone. Fulani cabal should stop their dirty diversionary tactics. You need not be an Einstein or a native doctor to know the man in Poland is not Buhari. All you need is common sense, ability to reason and a functioning eyesight,” the IPOB leader wrote on the micro-blogging site, Twitter. I said Jubril is an impostor, not a clone. Fulani cabal should stop their dirty diversionary tactics. You need not be an Einstein or a native doctor to know the man in Poland is not Buhari. All you need is common sense, ability to reason and a functioning eyesight.